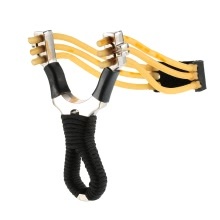 This slingshot is a good gift for professional and adventurous hunting lovers. It can be used for outdoor competition, fitness catapult and slingshot collection. UNIQUE DESIGN: High quality unique design, dull-polishing by handwork. PREMIUM MATERIAL: Zinc alloy material and high quality rope covering the handle and high-speed and high-tension rubber band. PROCESSING TECHNIC: High-precision CNC machining, all edges are specially polished and deburred, which can increase rubber band life. ANTI-SLIP: Rubber band around the handle and Nylon rope covering the grip in case of hand slippery. Warning: It is prohibited to use this product in any way that doesn&apos;t conform to local, state and federal laws and ordinances. Any damage to public or private property is the responsibility of the user or users&apos; legal guardian.